The International Etchells Class Fleet 13 - San Diego in conjunction with the San Diego Yacht Club invites all Etchells Fleet members in good standing to participate in the 5th Annual West Coast Spring Series. The series will encompass four regattas sailed in the Coronado Roads off Point Loma during the spring of 2019, hosted by San Diego Yacht Club. Participants will enjoy top competition, ideal spring sailing conditions and the SDYC world class facilities. The fall series started with Tom Carruthers on USA-1411 logging 3 race wins to take the top spot for the September One Design Weekend. Kjeld Hestehave on USA-971, who was preparing for the Worlds, was sailing noticeably fast all weekend and had 2 race wins to finish a close 2nd. Kris Zillmann racing USA-1066 won Race 3 and finished in 3rd place for the weekend. First and foremost, the IECA wishes all of you, and your families a very Merry Christmas, and a Happy New Year. May you have a safe, and relaxing holiday time. 2018 was a wonderful, and successful year for the Etchells. In a way, this was epitomised by the magnificent turnout in October for the World Championship in Brisbane. So many people from within, and outside of the Class are still talking about it. The International Etchells Class Fleet 13 - San Diego in conjunction with the San Diego Yacht Club invites all Etchells Fleet members in good standing to participate in the 4th Annual West Coast Spring Series. The series will encompass four regattas sailed in the Coronado Roads off Point Loma during the Spring of 2018, hosted by San Diego Yacht Club. 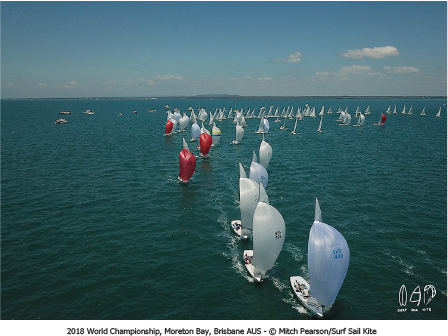 Participants will enjoy top competition, ideal spring sailing conditions and the SDYC world class facilities. This weekend over 20 boats raced in Coronado Roads for the 2017 ORCA Bowl which was the fourth and final event in the Etchells West Coast Spring Series. Over two days of racing, the Race Committee ran 6 races, using one as a throw out score. Sailors competed in sunny, but slightly breezier conditions than expected, especially on Saturday. The breeze built to about 15-20 knots on Saturday while the highest speed reached on Sunday was about 10 knots.